Mother of C-Forward employee named volunteer of the year! 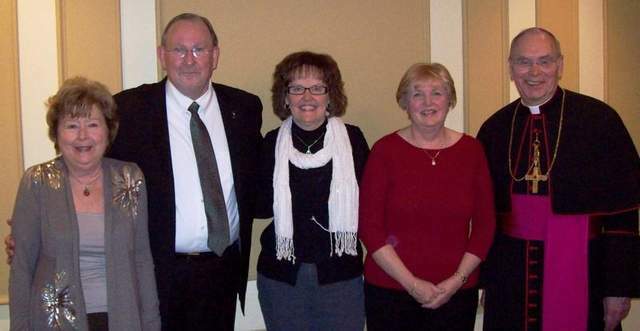 “Catholic Charities volunteer appreciation brunch was celebrated on Dec. 1 at the Madison South in Covington. The event, traditionally held on the first Saturday in December, kicks off the holiday season with an opportunity to thank all those who so generously support the work of Catholic Charities with their gifts of time and talent. Bill Jones, executive director, welcomed the volunteers and their guests by expressing his thanks for all they do for our staff and clients. “Our clients are so fortunate to benefit from your help and support during what are often some of the most challenging times of their lives. It is through your support in administrative and direct services that we leverage scarce dollars. We could never provide the quantity or quality of services we offer without your help,” Jones said. The Mother of God Folk Ensemble was on hand for the 22nd year to set the tone for the gathering providing beautiful and inspirational music and an opportunity to welcome in the season of Advent. • 10 years, Lisa Gastright and Phyllis Noll. This year Mary Gray of Boone County celebrates 30 years as a volunteer at Catholic Charities. Gray serves as the unpaid assistant volunteer coordinator with Joy Boothby. Her numerous activities with Catholic Charities include a stint as a member and president of the agency’s board. She has also served as a member CAVA, of the Board of Diocesan Catholic Children’s Home and as president of the Board of Welcome House. Best Antivirus Software: Tested On Protection, Performance, and Usability. C-Forward is dedicated to partnering with your business by first understanding your organization’s technology needs and goals; delivering peace of mind through a Personal, Proactive, and Reliable approach.